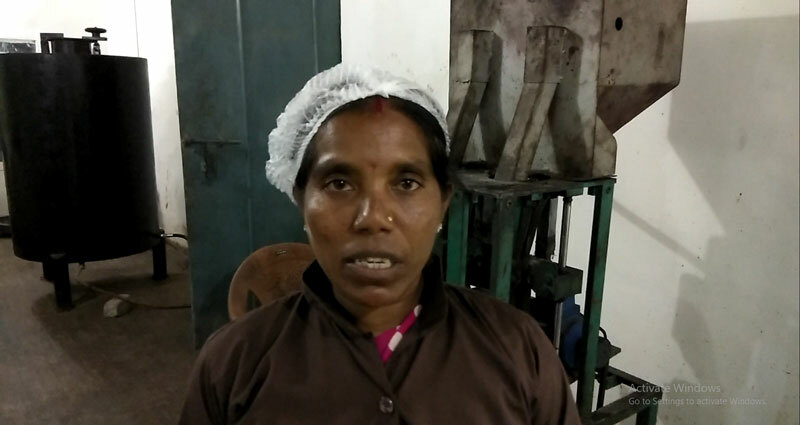 Jaymati Bai of works in a cashew processing unit in Raytoli in Jashpur district of Chhattisgarh. Her husband is a farmer. Her eldest son studied up to 10th standard and now he earns his living as a driver. Her daughter is in 11th standard. Jaymati is a member of a women’s Self Help Group that runs the cashew processing unit. This processing unit has played a significant role in uplifting these women and their families from poverty. Jaymati used to help her husband in the farm but the earning from the farm was not enough to meet all their needs. However, when she heard about the benefits of joining Self Help Groups she decided to give it a try. When the district administration of Jashpur set up a cashew processing unit, it was decided that a women’s Self Help Group would be given the responsibility to run the unit. Among various Self Help Groups, Jaymati’s SHG was chosen for this purpose. The women were given training and were given the responsibility to run the unit. Jaymati and the other women are successfully running the cashew processing unit. In this unit, the cashew kernels produced by farmers in various parts of the district are graded, processed, polished and then packaged under the brand name of Jashpur Cashew. The unit has been set up in an abandoned school building and the women like Jaymati run the entire process from steaming the kernels to packaging them. This has given Jaymati a steady income which has significantly affected her life. “Earlier I was not making much money but today this processing unit has is giving us a steady income. Our conditions have improved and we are able to meet various expenses. Our lifestyle and living conditions have become better. We don’t have to worry about our financial conditions anymore. We are confident that our conditions will improve further.” Says Jaymati. Jaymati’s story is an example of how the Chhattisgarh government’s vision of social upliftment has been materialised by synchronising different initiatives or projects. In the case of the cashew processing unit, for example, protecting the farmers from exploitation, improving the economy of the district, creating and promoting a brand that identifies with Jashpur district and women’s empowerment are the objectives that have been fulfilled in synchronisation. The cashew farmers are getting proper prices for their produce because of this unit because it has eliminated the brokers from eh chain. The cashew has been marketed under the brand name of Jashpur Cashew which is promoting the name of the district as well besides boosting the economy. By involving rural women from underprivileged backgrounds in the day-to-day operations of the processing unit, the objective of women’s empowerment has been achieved. Jaymati is more confident today than she used to be before getting associated with the processing unit. She is aware of the significance of the work she and her colleagues are doing. It is this awareness and the ability to run the machines efficiently that has given her and her colleagues a new found confidence apart from the increased income. That, she thinks, is an empowering experience.